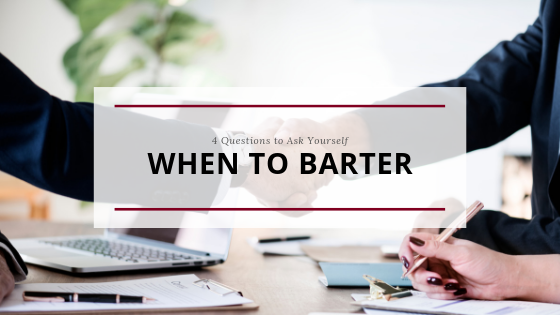 If you run your own business, bartering is one way for you to save cash. Even if you don’t run a business, there are still plenty of opportunities to save a lot of money by bartering. Want a low-cost date night? Barter babysitting time with your friend — you take care of her kids one night, she takes yours the next. Do you enjoy cleaning? You can barter cleaning services to a friend who doesn’t like to clean but then she can offer to help you with cooking, creating scrapbook, or whatever else you decide on. Need a new item of clothing? Find friends who are a similar size and barter or trade clothes with each other for a week, a month, or indefinitely. Getting ready for a big home renovation? Try finding friends, family, and contractors who might be interested in bartering their services for something you could offer in return. Looking for inexpensive private lessons for your child? Find someone who is willing to barter for some or all of the cost. There are tons of possibilities! There are times that are much more convenient to barter than others. For example: If you know someone who wants to utilize your organizing services for her craft area, and in return, she is making you beautiful handmade baskets or bags in return. Will the other person benefit from this deal of barter? Is it an equal “trade”? Is there a way I could make this a better deal for the other person? Could this barter negatively affect our relationship? Try to think through those questions before you offer a bartering proposition because even if you would love to get a good deal, you also don’t want to come across as a “cheapskate” who is only looking to get something for nothing without providing equal value in return.